Topic to explore: Things I want to Remember. Things that are meaningful/inspring to me. Paper: Dylusions Creative Journal has a mix of white bristol like paper and manila paper. Media: Mostly acrylics but collage, spray inks, oils, pastels and anything else I want to try this year. I bought this journal last year because I heard how wonderful it is and I wanted to try it out. I usually have an intended purpose when I buy a new journal but I didn’t have anything with this one. It sat at my desk for quite some time. Until one day I was particularly frustrated with myself and opened to the first page and created the piece you see above. I was annoyed with myself, With the way I see myself in the world lately. I was fed up and ready to be done. And I wanted to remember that feeling. So I painted and I wrote. It says: it is time to be brave. 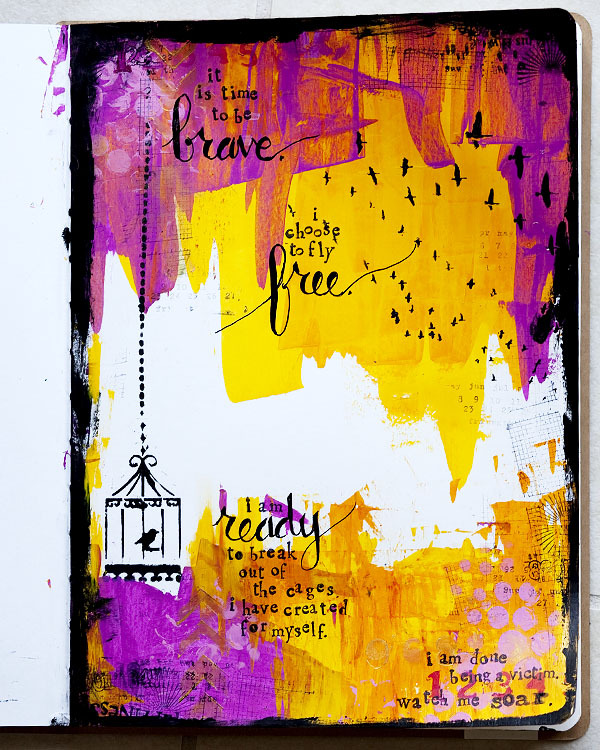 i choose to fly free. i am ready to break out of the cages i have created for myself. i am done being a victim. watch me soar. I then decided this would be my book for remembering messages that are meaningful to me. Things that I lose sight of. Things that I want to make a point to remember. When I was sitting down to think about my projects for 2014, I knew this book was going to be a part of it. I decided to couple it with something else I’d decided to take on for 2014: Life Book. I took a free class from Tam a few years ago and I have been a fan ever since. I was on the fence about taking this class in both 2012 and 2013 so this year I decided to just take the plunge. Knowing myself, I was aware that the best way to commit to a year-long class was to make it a part of one of my projects. So I decided this journal would be my Life Book for 2014. I plan to do the exercises/promopts/etc. in this journal. I might do exactly what the lesson is or I might just use the art technique and do my own topic, or I might just pick the topic and do my own technique. I am open to the possibilities and since I have never taken the class, I am not sure how it will turn out yet, but I am flexible. I am also taking The Walk with Brave Girls in January, so I am pretty sure I will incorporate those lessons into this book, too. At least that’s my current plan. I will also likely use it for my My Mind’s Eye Mixed Media pages. This will be my book of experimenting, having fun, trying new mediums, and keeping in touch with Art Journaling this year. For the first few weeks I will be sharing mixed media pages I’ve made for My Mind’s Eye last year in this book. They are all reminders that I need again and again. Here’s to a year or Remembering. I am excited to follow your lead. Having an inspiring project like “what I know” is something I can really follow to keep me motivated, and it’s also a great way to become more grounded and aware of inner growth. I love your art style and intend to follow!